Hamas urges residents to ignore Israeli warnings, fires volley of rockets at southern and central Israel. The IDF was yet to launch an expected bombardment of the northern Gaza Strip on Wednesday morning after having warned residents to evacuate the area believed to have a heavy concentration of rockets. The IDF had originally instructed them to leave the area by 8:00 a.m., but delayed the operation to allow Gazans more time to evacuate their homes. The IDF dropped leaflets in northern Gaza, for the residents of Sajaiya, Zeitun and Beit Lahia, and sent recorded messages and placed calls, warning civilians to leave and distance themselves from Hamas operatives as part of Israeli efforts to minimize civilian harm ahead of potential strikes. 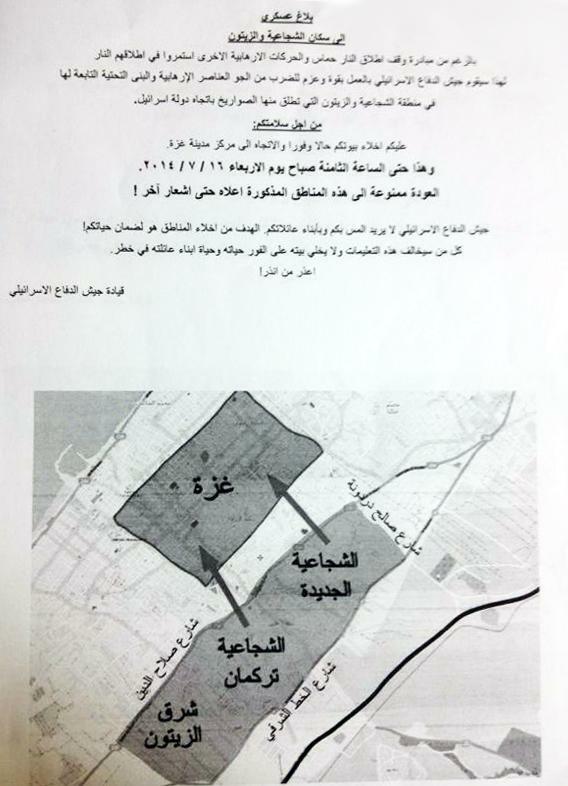 The leaflets told residents that despite a truce, Hamas and terror organizations continue to fire rockets, and that the IDF therefore plans to strike with much power against terrorists and targets in Sajaiya and Zeitun. "From these areas, rocket fire is being launched against the State of Israel. For your safety, you are requested to leave your homes immediately and travel towards Gaza City by Wednesday at 8 a.m. The IDF does not wish to harm you or your families. Clear the area to safeguard your lives. Do not return to the area until further notice. Anyone who does not heed these instructions... endangers his life and that of his family," the leaflet said. Some 20,000 Palestinian civilians have heeded previous Israeli calls and left Beit Lahiya in the northern Gaza Strip. Meanwhile, Hamas' Interior Ministry urged residents of Gaza not to heed the IDF calls to leave their homes, saying the warnings were part of Israel's "psychological war." Early Wednesday morning the Israel Air Force struck 39 terrorist targets in the Gaza Strip , and has hit a total of 1,750 targets since the start of the operation. The IAF launched four targeted strikes on terror operatives, the military said, and targeted operational infrastructure used to fire rockets into Israel. The navy fired on positions of armed organizations along the coast. Over the past 24 hours, 100 targets have been hit, including 47 underground launchers, tunnels, weapons production and storage facilities, and training camps. According to Palestinian reports, Israeli air strikes destroyed the houses belonging to senior Hamas officials Ismail al-Ashkar and Mahmoud Zahar - who is believed to be in hiding elsewhere. Prime Minister Binyamin Netanyahu and Defense Minister Moshe Ya'alon on Tuesday afternoon ordered the IDF to restart strikes on the Gaza Strip after Israel's unilateral acceptance of an Egyptian-brokered ceasefire was met with continuous rocket fire at Israel throughout the day. Since the ceasefire's proposed 9 a.m. start time, terrorists in Gaza fired some 141 rockets at Israel. Rocket fire continued after midnight Wednesday with the Iron Dome defense system intercepting a projectile over Ashkelon. Projectile fire on Tuesday lead to the first Israeli death since the IDF launched Operation Protective Edge more than a week ago. Diplomatic officials said that the IDF actions, which came at 3:00 p.m., six hours after Israel held its fire and responded positively to the Egyptian cease-fire proposal, were the result of Hamas and Islamic Jihad rejecting the ceasefire.